This beautiful chalet was constructed in 2005 and is a fantastic combination of modern architecture and original homely features such as reclaimed wooden beams. 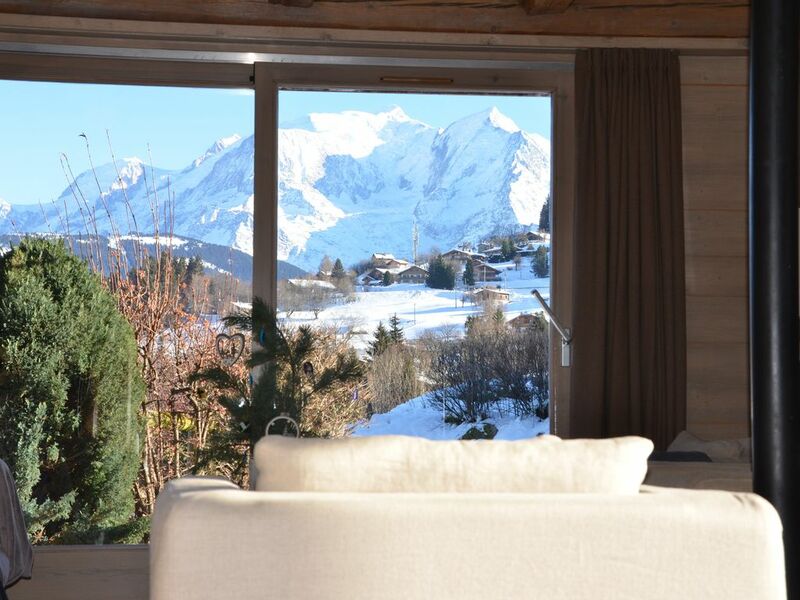 The chalet is semi detached and is the larger of the two properties, enjoying stunning, uninterrupted views of Mont Blanc from the comfort of the living room and terrace. Situated on a small, private road, the traditional mountain village of Combloux is a mere 5 mins walk providing easy and convenient access to skiing either via the ski buses or by car and to shops and restaurants. It also offers an exciting range of summer activities from cycling, horse riding, trekking and is a 5 mins walk from the unique ecological swimming lake. For skiing, the Combloux mountain resort is 10 mins drive and the spectacular ski resort of Megeve is 15 mins drive. The chalet also provides easy access to Chamonix (30 mins drive) and Cormayeur (45 mins drive). The airports at Geneve and Chambery are both approximately 1 hour's drive. The local area is bustling with winter and summer activities, e.g. skiing, snowboarding, mountain biking, hiking, swimming, white water rafting, parapenting, horse riding and relaxing with stunning views. It has a private garden ideal for summer games and barbecues. It backs on to sloped field which is great fun for apre ski sledging whilst enjoying a drink after leaving the slopes. There is a large garage which is useful for unloading ski boots and skis straight into a large boot room, fully fitted with ski storage and ski boot warming rack. Large, modern and open planned it is ideal for parties and games and movie watching. A mezzanine area upstairs is ideal for kid's video games and movies too. Our dream to own our own Alpine home began 5 years ago and we feel very fortunate to have found our chalet in Combloux. We wanted to find a home that would not only provide us with wonderful skiing and summer holidays but could also be a weekend retreat at any time of the year. So far it has exceeded our expectations, we love to arrive and we hate to leave! Combloux is very close to Megeve and has continued to retain the feel of a small alpine village, The views of Mont Blanc are breathtaking and it makes you feel alive. Our children who are 12, 8 and 6 also love it. In the summer they are five minutes away from their own fresh alpine water pool, walks to the village to buy fresh bread and treats and in the winter fantastic family skiing. We hope you enjoy it to. Brilliant location in both the winter for skiing and the summer for walking and hiking. Great access to the village and restaurants yet located in a private road so very quiet. Only 40mins from Geneva airport means no long arduous journey in front of you. We fell in love with our chalet and Combloux for many reasons - the uninterrupted views of Mt Blanc and it's ever changing micro climate, the valley below, the large glass windows let light stream in all day and give us a 360 view of the village, the slopes and Megeve. Combloux is a hidden gem of a Ski Resort, so quiet some times we feel we have booked it all to ourselves. And the chalet a wonderful mix of modern architecture and old wood and open planned living. En-suite bathroom to bedroom 1 with bath/shower over and WC. Bathroom 2 with bath/shower over. Bathroom 3 with shower, 3 additional separate WCs. The chalet is equipped with a modern wood burning stove that swivels to allow max heat in the open planned ground floor living room and dinning room area. Downstairs living room contains large, comfortable sofa, variety of armchairs, large flat screen TV and DVD player. A wood burning stove ensures that this room is warm and cosy throughout the year. The upstairs living room contains a sofa, TV, DVD, PS2. Modern kitchen constructed with traditional wood. Equipment includes cooker with gas hob and electric oven, large fridge/freezer, double sink, dishwasher and microwave. Large dining table that comfortably sits 8 to 10 people. The chalet has large glass windows which floods the chalet with natural light and warmth. Combloux resort, 10 mins drive to the slopes which are ideal for family and intermediate skiing/snowboarding, including a snow park. There are a range of mountain top restaurants. The ESF ski school is very active in Combloux Megeve - 15 mins drive. This is a large, well established resort with a superb range of slopes for all types and difficulties of skiing. ESF ski school facilities are available in Megeve. Chamonix - 30 mins drive. Cormayeur - 40 mins drive. Megeve golf course is approximately 15 mins drive. The chalet also provides easy access to a number of other local golf courses. Notes on accommodation: The accommodation is of the highest quality (rated 4 star). The whole of the ground floor is heated by underfloor heating. All other areas of the house are heated via radiators (as part of the central heating system). Outside: The chalet is set in its own private and secluded garden which is approximately 700m and has spectacular views of Mont Blanc. It is very safe and there is little traffic as the chalet is located on a private, no-through road. Utility Room: There is a large utility room in the basement that doubles up as a ski boot room. It contains a ski boot dryer, ski changing area, washing machine, tumble dryer and sink. Cleaning / Towels / Linen / Maid service: Towels and linen are not included, but can be provided by our local agent if required. Our agent will also arrange cleaning which is done once per week. Other: The property has a large garden covering approx 700m. It is ideal for children and very safe since the property is located on a private road with little traffic. There is a single garage which is integral to the property and a ski boot room. Wonderful chalet with a spectacular view. Inside is so comfortable that you would like to stay home all days. Bedrooms are quite spacious. We will come back for sure. C.
Thanks so much for your kind review, it means allot. Really glad you enjoyed your stay and we welcome you back anytime. Le chalet est très spacieux, bien aménagé, la vue sur le Mont Blanc est vraiment magnifique. Il est aussi très bien situé dans la station, à proximité des commerces et de la piscine naturelle. Le jardin est également très beau et bien entretenu. What an amazing chalet! We had an absolutely stunning holiday here as a family of two parents, three kids and two grandparents. We have stayed in Demi-Quartier for the past two years and skied from Princesse but needed somewhere bigger this year and fancied Combloux. We were doubly fortunate: so late in the season Princesses had no snow – this was not a problem at the north facing Combloux where the slopes were managed to last longer. Secondly and even more importantly XXXX is a truly awesome chalet, beautifully appointed and kitted out: a fantastic selection DVDs with an extra DVD and games console upstairs for the kids; great kitchen (we cook a lot so this can be real bugbear but all the kit was here and the kitchen a delight to cook in); comfortable beds and bedrooms; incredible views of Mont Blanc; a short walk into Combloux for croissants or restaurants. We didn’t even use the table tennis table in the garage because the kids were running about outside in the sun with a local dog and playing in the garden. We did use the dryers in the excellent boot room, though. The chalet was competitively priced against similar accommodation and Mark and Briege were super-responsive and helpful if we had any inquiries. In short, we totally loved it and are hoping to rebook as soon as possible. It slightly pains me to write this because if others get there first we might not be able to! Lovely atmosphere to the chalet; cosy without being small. Clean and well maintained. Good view of Mont Blanc. We are returning in the summer! Tous ces problèmes connus et non traités depuis mois/semaines comme en témoignent les commentaires des précédents occupants !!! Odeurs nauséabondes dans garage/laverie, vmc hyper bruyante. Fuite sous évier cuisine avec cuvette de récupération. Eclairage plafond de la cuisine. Quant aux chaises de salle à manger : une seule stable sur les 8 !!! Promesse de passage des artisans (électriciens, plombier) non tenue et c'est heureux . Les réparations sont à faire quand le chalet est libre !!! En résumé, beaucoup de temps perdu (téléphones, mails et messages) et de désagréments. Une location prometteuse sur le papier mais finalement trop de problèmes pour en jouir tranquillement : inacceptable !!! Une illustration de la règle : "encaisser" le loyer d'abord et maintenir la qualité de l'offre plus tard. Geneve and Chambery airports are both approximately one hour's drive from the chalet. Alternatively, the drive time from Calais is approximately 8 hours. The centre of the beautiful and historic mountain village of Combloux is 5 mins walk from the chalet. It contains a wide variety of restaurants and shops and hosts a traditional French market every Wednesday. Other local places of interest include: Megeve - 15 mins drive; St Gervais - 15 mins drive; Sallanches - 20 mins drive; Chamonix - 30 mins drive; and Annecy - 60 mins drive. The village of Combloux contains a supermarket, a number of shops and a variety of restaurants including traditional French bistros/restaurants and an excellent pizza restaurant.